Summary: A historical defense of the Resurrection account. Note: This is the third article in a series on the Resurrection of Jesus. PREMISE: God raised Jesus from the dead. PURPOSE OF ARTICLE: To harmonize apparent discrepancies in the Resurrection narrative. Last Easter, we established that the Resurrection of Jesus Christ did, in fact, occur. Today, as we celebrate the Resurrection once more, we will resolve aspects of the Resurrection story in all four Gospel accounts that are often viewed as contradictions. From this, we see, once and for all, that the story of Easter is not a hoax, but an accurate retelling of the greatest miracle in human history. Christ is risen indeed! 1. What time of day did the women go to the tomb? Explanation: All four Gospels agree that the women visited the tomb after the Sabbath and on the first day of the week, but Mark says it was after sunrise and John says it was before. Based on John 11:18, we may conclude that it took two miles for the women to journey from their home in Bethany to the burial site. The sun could have easily risen during their walk to the tomb, explaining why John mentions the “still dark” period (when they started their journey) and Mark refers to a period after sunrise (when they arrived). 2. How many women went to the tomb? John 20:1: Only Mary Magdalene is mentioned. Explanation: None of the Gospels say that only the women mentioned in that account were present. The Gospel writers are merely focusing on certain people in their individual narratives. Imagine if I said, “Scott, Joe, and Adam went with me to the cafeteria,” and my friend Jesse said, “I went to the cafeteria with Vinh, Scott, and Jake.” We would both be right; I merely omitted Jake, and Jesse omitted Joe and Adam from the narrative. 3. Was the tomb already open? John 20:1: The stone is already rolled away from the tomb. Explanation: Mark, Luke, and John record that the women all see the stone rolled away from the tomb. Matthew merely gives the explanation for what caused the stone to be rolled away; he is not saying that the earthquake occurred as the women were approaching the tomb. 4. How many angels were present? Matthew 28:5-7: One angel rolls back the stone and sits on it. He commands the women to tell the disciples that Jesus has risen and is going before them to Galilee. 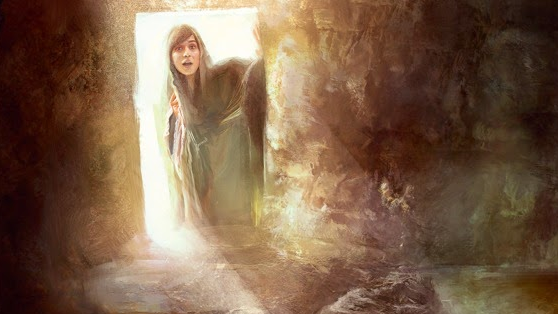 Mark 16:5-7: Upon entering the tomb, the women see a young man dressed in white. He commands the women to tell the disciples that Jesus has risen and is going before them to Galilee (in language very similar to that of Matthew’s account). Luke 24:4-7: Two men in dazzling apparel stand before the women and tell them that Jesus is risen. They remind the women that Jesus predicted his death and resurrection. John: No angel is mentioned. Explanation: There were two angels, both dressed in white dazzling apparel. Matthew and Mark merely focus on the main spokesperson for the two. No one is mentioned in John’s account because Mary Magdalene may have left early to tell Peter and John about the empty tomb before the rest of the women encountered the angels. 5. Did the women tell the disciples, and what was their emotional state? Explanation: The Gospel of Mark ends abruptly with this verse, so it is possible that the women were too afraid to speak at first. But then, as Matthew and Luke describe, they worked up their courage and told the disciples. Before all of this, Mary Magdalene, as mentioned above, had already departed and told Peter and John, and the three of them came back to the empty tomb. The fact that the Gospels do not perfectly align on every detail demonstrates that the Gospel writers did not merely get together and craft a single narrative that they could all copy down later. Eyewitness accounts are often divergent on the focus of individual details, but they rarely contradict each other in substantial content. Note that there are no contradictions between the Gospel accounts, and any apparent contradictions are easily reconciled. Kossi, Abalo. In Lumine Tuo: Why Believe in God? Pittsford: Bookseller Castle Rock, 2010. Print. Guys, thank you so much!! Always such a joy to see how many people are impacted by these articles. He is risen indeed! Vinh, love your work as always. Christ is risen! What a blessing this blog is, and to think you guys have been going for a year. Keep it up. Never thought about Mary Magdelene leaving first. Awesome article! He is risen!! Amen, brother. He IS risen, indeed!